Of course I was going to buy the Too Faced Love Eyeshadow Palette the moment I saw photographs! For starters, there was a whole quintet of rosy shades. For another, the packaging. I love cursive writing and letter-writing, and only use fountain pens, so anything with letters written in cursive appeals to me. Finally, the formula is what Too Faced calls "innovative slurry powder technology" - apart from being a sucker for anything new formula-wise, I read it was similar to Etude House eyeshadows, and I own and love quite a few of those. Too Faced also calls this palette the "Passionately Pretty Eyeshadow Collection" - some of the shades certainly are pretty! I should have thought that a palette like this would come out around Valentine's Day, but who am I to complain when good makeup comes out at any time of the year? Read on for my review and swatches of the Too Faced Love Eyeshadow Palette, and an eye makeup look. The lid shows an envelope with old-fashioned cursive writing, in a fountain pen, no less. The sturdy plastic box comes with a mirror, 15 eyeshadows arranged in three quintets (with a heart design in the middle, and hearts embossed on two shadows per quintet), a black waterproof eyeliner pencil and three "look" cards. There is also a Perfect Eyes Waterproof Eyeliner in Perfect Black. I prefer getting eyeliners in palettes, rather than brushes. I have my own favourite brushes, and the presence of an eyeliner helps avoid hunting for one while in a hurry. There is a mix of neutrals, plums and golden-tones, and a green and a pink to brighten up matters. I did have my worries about the shades being too shimmery for me. But they are not disco-level shimmery, honest! I am a matte lover and I love this palette. Dearest: Gold. Fell out of the pan when I merely looked at it went near it with a brush. Crumbled completely when I tried to put it back and the whole place was golden, like King Midas's palace. Amorous: Deep plummy-brown. The glitter does not turn up in swatches. True Love - my favourite quintet. Sweetie Pie: Shimmery bright pink. Passion: My favourite shade of them all. Golden purple. Smitten: Pale, pale pink. Slightly patchy. Romance: Medium brown matte, but disgustoid powdery formula that applies patchy to boot. This happened when I was swatching it and I had to clean up and start again. Obsessed: Purple-brown. Complements Passion very well. Devotion: Typical golden beige that is great for highlighting for me. Everlasting: Very, very dark, almost blackish green. Check out finger-swatches of Darling, Passion and Puppy Love. No primer, all dry swatches. 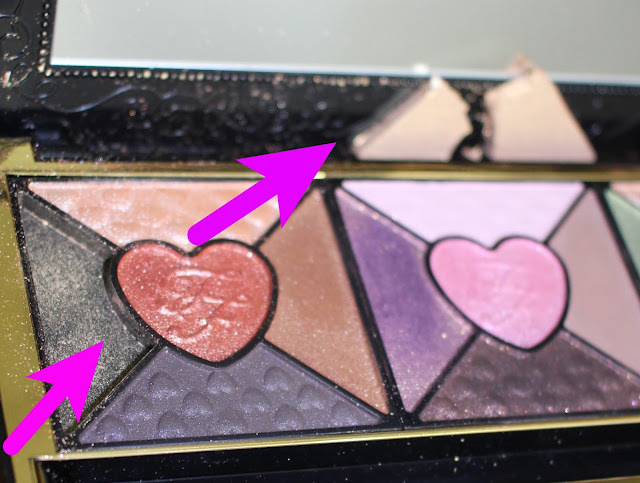 Formula and pigmentation of the Too Faced Love Palette. The formula reminded me a bit of the So Susan Cosmetics liquid-powder eyeshadows, reviewed here. Too Faced says the "slurry powder" technology makes the liquid powder soft, velvety, multi-dimensional and highly pigmented. These eyeshadows are smooth, and softer than softness. Think super-finely-milled-powdery soft. So yes, there is a bit of fallout for most shades, especially glittery ones. With these, it is better to do your eyes first so you can clean up any fallout while doing the rest of your face. These are mostly very pigmented and I love all but two of them. Smitten was quite patchy and required some work to show up decently. I am not happy with Romance either; I needed multiple swipes to get some colour going as the fiddly thing kept crumbling on me. When I was in the middle of swatching this palette, this happened to the shade Dearest. I swear I did not drop the palette or knock the shade out, but only dipped a brush into Dearest, and the whole cake decided to accompany the brush out of the pan and dropped itself at the edge of the mirror, giving me instant tachycardia. Attempts to put Humpty Dumpty back together resulted in my fingers being covered in gold, like King Midas. It settled down after I emptied half a bottle of rubbing alcohol into the pan, waited an hour with bated breath and then tapped at it with a tissue. So. Be careful. Be very careful, even while dipping a brush in. And while travelling with this. I did not notice any creasing, not even on my oily lids which even tend to ignore primer. Great payoff. Equally good wear-time. I always use primer on my eyelids, so I cannot tell you how well these last without primer. While applying these shadows, I find it is easier to press on the colours with a good eyeshadow brush - that helps minimise fallout. You do not need glitter glue or wet brushes to make this work. All swatches are dry, on bare skin, without primer, made with dry EcoTools brushes. Row II: Dearest, Amorous, Desire, Passion, Obsessed, Darling, Everlasting, Puppy Love. A quick word about the eyeliner. It is jet black, super-pigmented and creamy. It stayed on the lower lashline nicely. Can you see how Smitten and Romance look patchy? The others look fine. I used my favourite shade, Passion, on the eyelid, with Dearest in the inner corner and a smidgen of Obsessed on the outer corners. I also used the Too Faced eye pencil on the lower lashline but did not do anything else on the upper lid, apart from some UD Perversion mascara on the lashes. For primer, I wore my favourite Kat von D High Voltage Eye Primer. I pressed on the colour first before blending lightly. All shadow applied dry. See what I mean about the shades being wearable and not disco-shimmery? If I can pull these off, anyone can. If you look very closely enough, you can see some glitter fallout in the under-eye area. For me, the Love Palette is a hit. Apart from Romance and Smitten, I can use everything. I found 13 of these eyeshadows creamy, smooth and easy to apply. Thirteen out of fifteen shadows is not bad! Some of the shades are gorgeous, especially Passion, Darling, Obsessed and Desire. Fallout is collateral damage that comes with most powder eyeshadows, so I am not too bothered, to be honest. I do have to clean up the under-eye area with a Q-tip dipped in micellar water, but I can live with fallout as long as the eyeshadows blend well and there is good colour payoff. I also like the idea of anything new and innovative, so new formulae will appeal to me. My gripe is how careful I need to be while dipping a brush in those pans. I have already had one shade coming out of the pan with the brush and crumbling, and I am a rough hand, so I worry I will ruin the whole thing one day and end up with fine powder spread over a mile's radius. 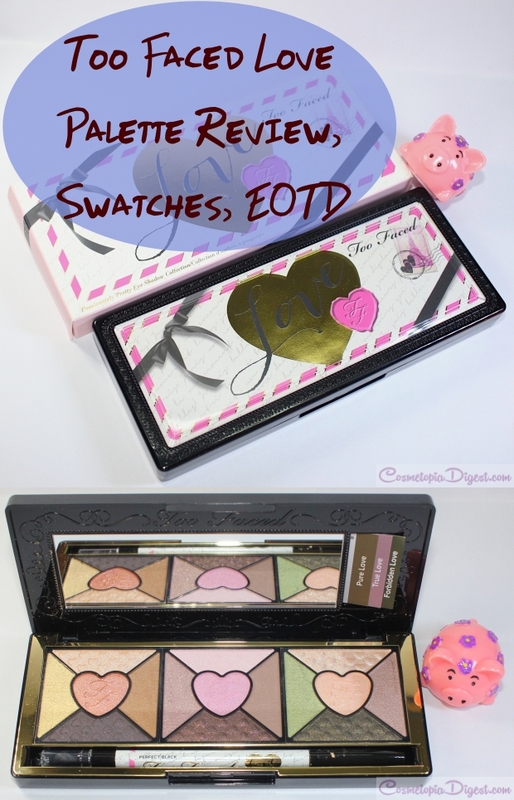 So, do you need the Too Faced Love Palette? If you have similar taste in shades and don't mind a bit of fallout in the cause of good pigmentation and some great makeup, then, yes, you do. Always good to try something new. Go for it! The Too Faced Love Palette costs $49 in the US and is available here and here. It is available in Debenhams UK and Sephora across the EU from August. Will you be buying this palette? Why (not)? Tell me in the Disqus comments widget below.